Located at 3036 NE MLK Jr Blvd, the Garlington Health Center offers integrated healthcare — mental health, addiction treatment, primary care, and wellness services – all in one location to support a person’s whole health needs. The new campus is also home to Garlington Place, a 52-unit affordable housing apartment building providing Cascadia clients, veterans and displaced N/NE Portland community members access to affordable housing in NE Portland. The Garlington Health Center is one of the state’s most innovative community-centered campuses: a place where healing, homes, and hope come together. The health center will also house a CVS Pharmacy available to the community, as well as community rooms. The landmark campus was designed by Scott Edwards Architects and constructed by Colas Construction. Garlington Place recently received Platinum Status from Earth Advantage, and Cascadia expects a similar designation for the health center. The new campus will also be home to a beautiful new mural reflecting the neighborhood history by Arvie Smith, paintings and portrait of Rev. Dr. John W. Garlington, Jr. by Jeremy Okai Davis exterior stainless steel tree sculptures by Hillary Pfeifer, and bamboo/mixed media by Anne Crumpacker. 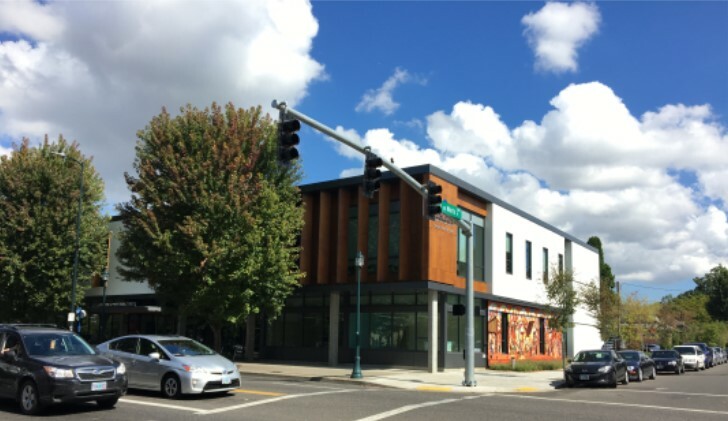 Cascadia Behavioral Healthcare would like to thank the Eliot Neighborhood Association and community members for your support and patience during the construction. The agency is looking forward to being an integral part of the neighborhood and community for years to come. For more information or for follow up questions, please contact the health center director, Cheryl Goluch, or the apartment community manager, Tasha Criss.